Discussion in 'Orchid Species' started by GaryYG, Jan 28, 2019. 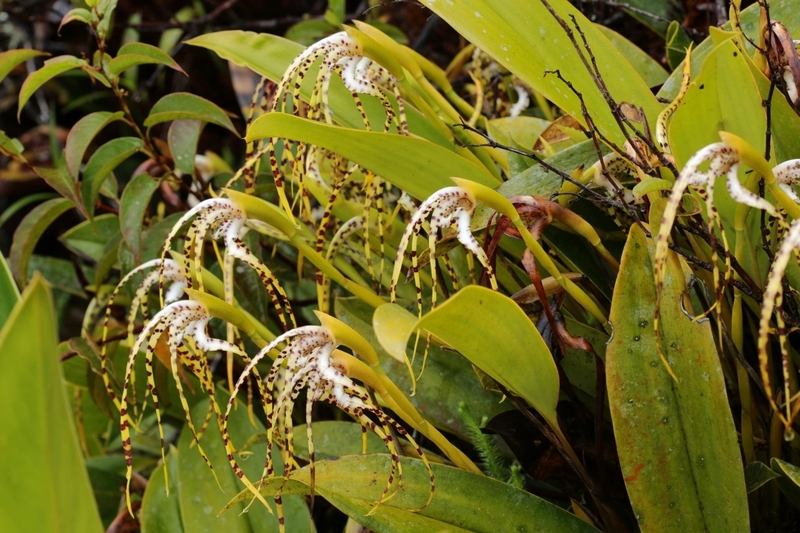 Several of us photographed Maxillaria speciosa on the Orchid Conservation Alliance tour of Colombia in November 2018. Many of the plants had finished, but there was one large plant with numerous large showy spidery flowers. This was on the trail leading up from Montezuma Rain Forest lodge in Tatamá National Park at around 2,500 m elevation. The cloud forest habitat is always wet. During the "dry season" there is less rainfall, but the atmosphere is always humid and buoyant. Max. speciosa is distributed in Colombia and Ecuador. The flowers have a delightful fragrance which reminds me of frangipani. I'm fascinated by the long segments, yet the lip is so small. I was lucky enough to find this insect clambering over one of the flowers. Could this be the pollinator? Unfortunately, I could not wait around for it to find the source of the fragrance and check out whether it managed to remove pollinia. DarleneJay, Sideum and DPfarr like this. Great photos! You are doing a super job advertising for future tours. I wanted to sign up for the Columbia trip, but all the slots had filled at that point. I also have seen a brief video of the tour which was quite nice. That's a phenomenal plant! Thank you for sharing it! That is an aspect that many folks just don't seem to grasp. There may be less rain, but they are still moist, if not wet from dew, which tells me that a "winter rest" has much more to do with reduced nutrition than reduced water. Here's another plant from the same location. What a wonderful expedition that was! Very nice! It is unlike that the paper wasps are their pollinators, but it would be interesting.